Lesleigh & Blarney | Giving Back ";s:21:"divi_integration_body";s:415:"
Lesleigh and her Dog Guide Blarney live in Charlottetown, PEI. 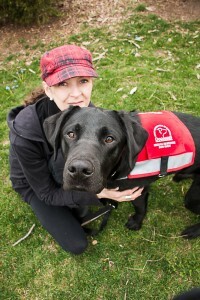 Blarney, a Seizure Response Dog Guide, has made an immeasurable impact on Lesleigh’s life. Lesleigh suffers from debilitating seizures daily, and has experience up to 13 in one day. Due to the frequency of her seizures, Lesleigh was severely injuring herself as they would come without warning. She has broken both arms, legs, her jaw, suffered multiple concussions, and a skull fracture which left her in a coma for three days.